Lung transplantation–related pathology encompasses a spectrum of disorders that include, but are not limited to, indications for lung transplantation (seen in explanted lungs), surgical complications (airway anastomotic and vascular complications), ischemia-reperfusion injury, rejection (acute and chronic), infections, and posttransplantation lymphoproliferative disorders (PTLDs). Over the last two decades, lung transplantation has become an accepted modality of treatment for many end-stage lung diseases. With greater experience and analysis of significant numbers of cases, lung transplant recipients are living longer, and follow-up regimens are becoming streamlined. Thus, a comprehensive understanding of lung transplantation–related pathology is now necessary for both tertiary care pathologists dealing with highly specialized lung transplantation teams and a much larger spectrum of healthcare providers who may be involved in the care of lung transplant recipients or candidates for lung transplantation. In the ISLHT 2012 report, lung transplantation–related pathology, specifically acute rejection, was reported to affect 34% of lung transplant recipients within the first postoperative year. The etiology of lung transplantation–related pathology is almost always immune-mediated. The transplantation of a ”foreign” organ, despite meticulous matching for donor-recipient compatibility, leads to a complex adaptive and innate immune system–mediated injury. Although aimed at protecting the host from infection, in the context of transplantation, this injury leads to allograft rejection. Such chronic injury is usually mediated by anti–human leukocyte antigen antibodies. As noted above, advances in tissue typing and cross-match testing deter severe rejections. Rejection may result from direct cellular attack (cellular rejection) or be mediated by antibodies (humoral rejection). Both are discussed below. Clinical features can range from an absence of symptoms to signs and symptoms of respiratory distress and/or infection and are not detailed in this article. Of note, clinical findings do not play a role in the pathologic grading of rejection. A quick intraoperative gross examination of the lung allograft may reveal previously unrecognized lesions, the nature of which could be addressed with frozen section analysis. Although rare, pulmonary embolism, infections, or neoplasms in the allograft may be diagnosed in this manner, which would affect the decision to use the donor lung. Explanted lungs should be fixed in formalin (preferably by inflating through the main bronchus) for 8-12 hours and sliced at 1-cm intervals. The cut surface shows the characteristic findings of the disease for which lung transplantation was indicated. Emphysema is end stage and generalized by the time the patient needs transplantation. Patchy fibrosis with greater involvement of lower lobes and subpleural regions is readily apparent in idiopathic pulmonary fibrosis. In cystic fibrosis, the dilated bronchi are usually plugged by yellow-green mucopurulent material. 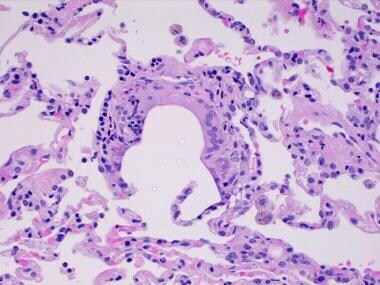 The largest pulmonary arteries have small yellow atherosclerotic plaques in pulmonary arterial hypertension. In the explanted lung, the classic findings of the primary disease are readily apparent; in addition, there may be superimposed foci of acute inflammation, organizing pneumonia, and mucostasis. In the transplanted lung, material for histologic evaluation is obtained via transbronchial biopsy and is analyzed after formalin fixation and paraffin processing. Tissue is obtained either as part of surveillance protocols or as clinically indicated by new onset of symptoms. With current immunosuppressive regimes, the incidence of acute rejection is low, but chronic rejection is still the main complication that limits long-term survival. The ISHLT grading of lung transplant rejection was updated in 1996  and revised in 2007  (see Table 1). Grades B and C are simplified in the latter; however, many clinicians and pathologists still use the former since it offers more information on which treatment decisions can be based. *”R" denotes revised grade to avoid confusion with the 1996 scheme. Given the patchy nature of rejection, a consensus statement by the Lung Rejection Study Group recommends 5 fragments of well-expanded alveolated lung (with bronchioles and >100 alveolar spaces) be examined. This may require more than 5 transbronchial biopsies, especially to recognize features of bronchiolitis obliterans (BO). Specimens may be gently agitated in formalin to inflate the fragments and require sensitive handling to avoid crush artifacts. Histologic examination should include sections from 3 levels of the paraffin block for hematoxylin and eosin (H&E) staining. Connective-tissue stains may help evaluate any submucosal fibrosis. Silver stains can be performed for fungi. 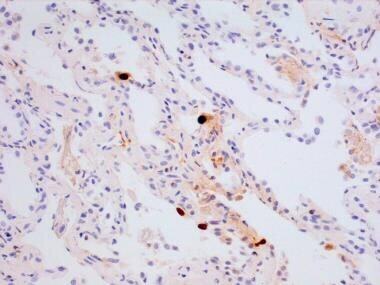 Immunohistochemical stain for cytomegalovirus is very helpful and strongly recommended. Concomitant bronchoalveolar lavage (BAL) fluid may be analyzed to exclude infection but plays no role in the diagnosis of rejection. If the biopsy samples contain diagnostic material but do not meet the minimum assessable criteria, grading should be carried out as usual, with a comment describing the number of lung fragments with emphasis that the material may not be representative of the overall allograft. Similarly, if no alveolated lung or no airway is present, the type of rejection should be indicated by the appropriate letter, suffixed by an "X" (see below). 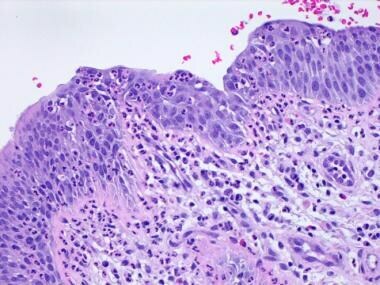 Biopsies taken for rejection surveillance should always be evaluated for histopathologic features indicative of infection, aspiration, organizing pneumonia, recurrent disease (eg, sarcoidosis), and PTLD. Acute rejection may occur at any time (days to years) following transplantation but is primarily seen between 2 and 9 months. The diagnosis is based on the presence of perivascular or airway inflammatory infiltrates that are composed mainly of activated lymphocytes but also contain few eosinophils, neutrophils, and plasma cells. 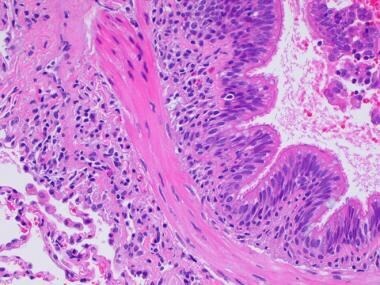 The intensity and the distribution of the infiltrate form the basis of the histologic grade. With multiple foci of rejection, the grade reflects the most advanced pattern of rejection rather than the predominant or average pattern. It is imperative to note evidence of aspiration (see image below) or concomitant infection, since these may precipitate rejection. 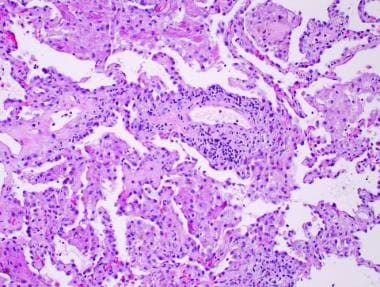 Clinical findings play no role in histopathologic grading of lung transplant rejection. Grade B cellular rejection (lymphocytic bronchiolitis in the rejection classification) was described in the 1996 update according to a scale of B0 to B4, (see Table 1) with B1 being treated only if accompanied by clinical symptoms of rejection, and B2 and above being treated regardless of symptoms. The 2006 revision of the B grades collapsed the 4 previous grades into two and retains B0 (no airway inflammation) and BX (ungradeable). Airway inflammation may be present in the absence of perivascular infiltrates. Grade B infiltrates represent a clinically important type of acute rejection since they have been shown to be a very strong risk factor for chronic rejection, necessitating their identification in allograft biopsy samples. Thus, many clinicians and pathologists prefer to use the 1996 grading system, which can be easily translated to the 2007 grading (but not vice versa), if needed, for comparison. 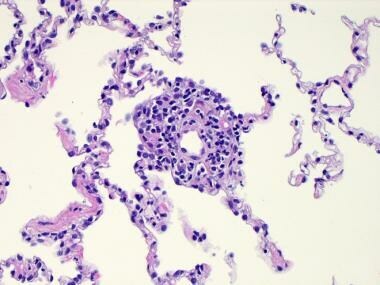 Bronchial associated lymphoid tissue is often present and should not be interpreted as rejection (see image below). Antibody-mediated rejection, also called humoral or hyperacute rejection, is not included in the ISHLT classification owing to the scarcity of reports in the literature. 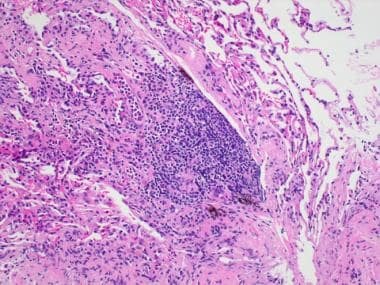 There is no consensus on its recognition and diagnosis by either histopathologic or immunologic methods, nor on its significance and treatment. Antibody-mediated rejection is characterized by the activation of inflammatory pathways along with the complement and coagulation cascades due to binding of preformed antibody to endothelial cells. Progressive respiratory failure within minutes to hours after transplantation suggests antibody-mediated rejection. It is also thought to occur weeks or months after transplantation upon development of serum antibodies. Histologic evaluation reveals diffuse alveolar damage (DAD), fibrin thrombi, vasculitis, intraalveolar hemorrhage, and interstitial neutrophilia. Chronic rejection usually occurs after 1 year posttransplantation but may be seen within as early as a few weeks. It is the most significant complication limiting long-term survival, affecting up to 50% of patients at 3 years posttransplantation. A previous episode of acute rejection is the most well-recognized risk factor. Persistent significant decreases on lung function tests are the most reliable method to diagnose chronic rejection (clinically termed bronchiolitis obliterans syndrome). It manifests pathologically as BO, a chronic, progressive fibroinflammatory occlusion of small airways. The pathogenic mechanism of chronic rejection is poorly understood but is thought to result from the monocyte/macrophage system with the airway epithelium, with up-regulation of major histocompatibility complex (MHC) antigens, costimulatory molecules, and adhesion molecules, leading to an outpouring of inflammatory and fibroproliferative mediators. Chronic rejection should be suspected with an insidious onset of generalized symptoms, including cough and dyspnea with a progressive decline on pulmonary function tests. 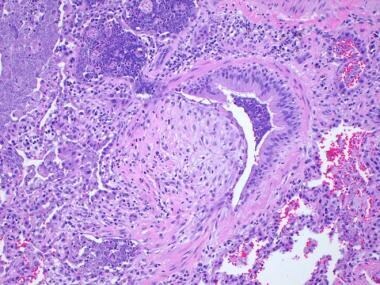 Although often difficult to diagnose on a transbronchial biopsy, BO is the characteristic histologic feature of grade C chronic rejection. In the early phase, the fibrosis is loose and often contains mononuclear inflammatory cells. Later, dense eosinophilic fibrosis is present in the bronchiolar submucosa, resulting in luminal occlusion. Destruction of smooth muscle of the airway wall may be present. 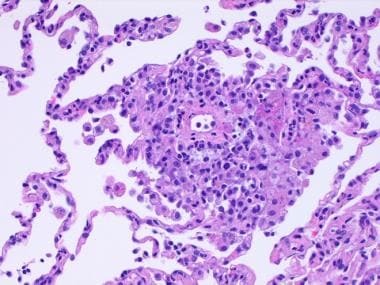 Distal airspaces often reveal mucostasis with foamy histiocytes and lipoid pneumonia, which may be a histologic clue when BO is not seen in biopsy material. Transbronchial biopsies are insufficiently sensitive for the detection of obliterative bronchiolitis, and a diagnosis of BO may require a wedge biopsy. Many clinicians want to know if the fibrosis contains inflammatory cells so that they can be targeted by appropriate treatment; thus, the 1996 grading is preferred. Chronic vascular rejection (grade D rejection) is characterized by fibrointimal thickening of arteries and veins, with or without inflammatory infiltrates. Chronic vascular rejection is not diagnosed with transbronchial biopsies. Overall, grade D rejection is rare and has not been reported to cause significant allograft dysfunction. It is most often seen in the setting of BO. Because of immunosuppressant therapy, transplant recipients are at an increased risk for both common and opportunistic infections. Bacterial infections tend to occur in the first month posttransplantation, with viral and fungal infections usually following within the first 3-6 months. Lung allograft infection is usually diagnosed based on clinical signs and symptoms, microbiologic cultures, and serum viral testing, but only occasionally with transbronchial biopsy. 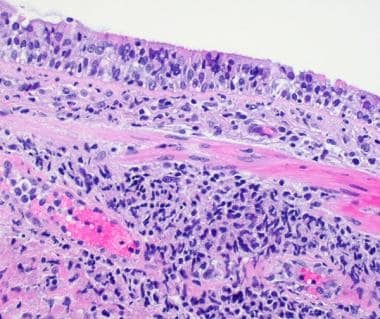 Histologically, the presence of neutrophils in airway epithelium (see image below) raises the differential of bacterial infection versus grade B cellular rejection. Similar to other immunocompromised situations, gram-negative infections in transplant recipients may not elicit significant inflammatory responses. Bacterial cultures are prudent in light of clinical suspicion. Mycobacterial infection is very rare. It may cause granulomatous inflammation in the lung allograft recipient and can result from either Mycobacterium tuberculosis or atypical acid-fast organisms. 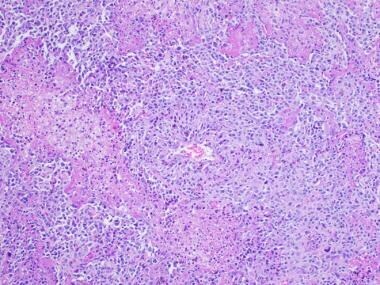 Cytomegalovirus (CMV) infection can be diagnosed on H&E sections; however, immunohistochemistry for CMV antigens allows for earlier detection and treatment, especially in the first posttransplantation year (see image below). 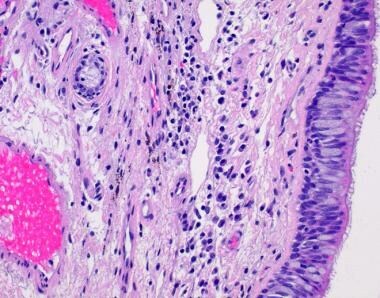 Histologically, CMV is characterized by enlarged cells (cytomegaly) with single large basophilic intranuclear inclusions and a clear halo. Viral infections may also be diagnosed with serologic techniques or culture. Matching the CMV status (donor and recipient), widespread use of prophylaxis, and the monitoring of viral load with polymerase chain reaction (PCR) have significantly reduced the incidence of CMV pneumonitis in transplant recipients. Viral infection places patients at a higher risk of acute and chronic rejection and death. Silver stains help highlight fungal yeast/hyphae. Culprit organisms include Candida species, Aspergillus, and Mucor. Owing to routine prophylaxis, Pneumocystis infection is extremely rare. PTLD is an Epstein-Barr virus (EBV)–driven condition that has been described in all transplant populations and is a particular problem in lung allograft recipients, in whom it usually involves the allograft itself, as well as nodal and extranodal sites. Improved immunosuppression modalities have decreased the overall incidence of PTLD, reported to vary between 1.8% and 5%. In most cases, the diagnosis of acute and chronic rejection is made on H&E-stained sections. The role of C4d immunostaining for antibody-mediated rejection in the lung is still controversial. Immunostaining for lymphocyte markers (B- and T-cells) and in situ hybridization for EBV mRNA (EBER) and CMV may be performed as appropriate. According to the ISHLT 2012 report, risk factors for 1-year mortality are related to the indication for transplantation. Poor prognostic factors include older recipient age, lower transplant-center volume, lower cardiac output, lower forced vital capacity, higher pretransplantation bilirubin levels, higher supplemental oxygen need at rest, and increasing negative donor-recipient height difference. Graft failure and non-CMV infections are reported to be the major causes of death within this period. Data vary, with some centers reporting greater than 85% 1-year survival rates. Substantial improvements in quality of life and functional capacity of lung transplant recipients have been reported. Christie JD, Edwards LB, Kucheryavaya AY, Aurora P, Dobbels F, Kirk R, et al. The Registry of the International Society for Heart and Lung Transplantation: twenty-seventh official adult lung and heart-lung transplant report--2010. J Heart Lung Transplant. 2010 Oct. 29(10):1104-18. [Medline]. Yousem SA, Berry GJ, Cagle PT, Chamberlain D, Husain AN, Hruban RH, et al. Revision of the 1990 working formulation for the classification of pulmonary allograft rejection: Lung Rejection Study Group. J Heart Lung Transplant. 1996 Jan. 15(1 Pt 1):1-15. [Medline]. Stewart S, Fishbein MC, Snell GI, Berry GJ, Boehler A, Burke MM. Revision of the 1996 working formulation for the standardization of nomenclature in the diagnosis of lung rejection. J Heart Lung Transplant. 2007 Dec. 26(12):1229-42. [Medline]. Reams BD, McAdams HP, Howell DN, Steele MP, Davis RD, Palmer SM. Posttransplant lymphoproliferative disorder: incidence, presentation, and response to treatment in lung transplant recipients. Chest. 2003 Oct. 124(4):1242-9. [Medline]. Hunt J, Stewart S, Cary N, Wreghitt T, Higenbottam T, Wallwork J. Evaluation of the International Society for Heart Transplantation (ISHT) grading of pulmonary rejection in 100 consecutive biopsies. Transpl Int. 1992. 5 Suppl 1:S249-51. [Medline]. Husain AN, Siddiqui MT, Holmes EW, Chandrasekhar AJ, McCabe M, Radvany R, et al. Analysis of risk factors for the development of bronchiolitis obliterans syndrome. Am J Respir Crit Care Med. 1999 Mar. 159(3):829-33. [Medline]. Khalifah AP, Hachem RR, Chakinala MM, Schechtman KB, Patterson GA, Schuster DP, et al. Respiratory viral infections are a distinct risk for bronchiolitis obliterans syndrome and death. Am J Respir Crit Care Med. 2004 Jul 15. 170(2):181-7. [Medline]. McKane BW, Trulock EP, Patterson GA, Mohanakumar T. Lung transplantation and bronchiolitis obliterans: an evolution in understanding. Immunol Res. 2001. 24(2):177-90. [Medline]. Tikkanen J, Lemström K, Halme M, Pakkala S, Taskinen E, Koskinen P. Cytological monitoring of peripheral blood, bronchoalveolar lavage fluid, and transbronchial biopsy specimens during acute rejection and cytomegalovirus infection in lung and heart--lung allograft recipients. Clin Transplant. 2001 Apr. 15(2):77-88. [Medline]. Table 1. ISHLT Grading of Lung Transplant Rejection—1996 and 2007.